A beautiful film about that every person experiencing the loss of one of the most important people in the life in his own way. For example, the main character of Billy Crudup has lost his son in the car accident. We cannot blame him that he began to sing with the guitar afterwards. After all, this way to exile the pain from his heart is the most effective. Dive headlong into the job, drinking spirits and music – these are the main options out of these difficult situations. Our protagonist chose the path that is not just the least destructive. He is also able to create something new and good: assembled the band of common thinkers, learned how to play the guitar, felt the taste of life… In the end of the film, he was able to do something really good and instructive for the audience. And for himself, of course. Music performed almost entirely by the main character and his band. 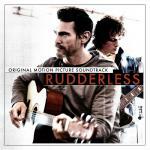 Rudderless is the name of his band and a motion picture. The singers make music product in the genre of rock. However, let's be honest, a lack of professional training is felt. As for the music, which promotes good mood, switching to other more positive things, it is good. As something more professional – probably not. Not enough soul and skills. The best songs in the collection, perhaps, have to be recognized Real Friends and Beautiful Mess. Selena Gomez co-performed here the composition Hold On – such a positive name always implies an encouraging content. This song didn’t become an exception having the same inspiring content too.